Uganda, Africa — A Ugandan pastor reports that he was arrested and chained to a tree last weekend for distributing a Gospel film outside one of the largest megachurches in the nation. Pastor Bill Issa of Reconcilation Outreach Ministries states that he and a team of five Christians set out last Saturday to distribute copies of the film The Biggest Question at Miracle Center Cathedral in Kampala when they were met with opposition from police. They had just finished up a distribution at St. Lawrence University where approximately 300 students received copies of the Gospel film, which features Kirk Cameron, Todd Friel and RW Glenn sharing about matters of life and eternity. Issa serves as the Ugandan team leader for the global The Biggest Question distribution effort, headed up by Friel’s Wretched outreach in Minnesota. 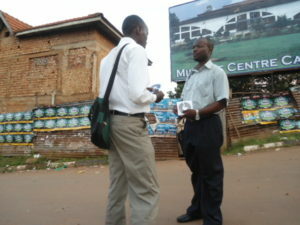 When the police noted that the Christians were distributing copies of The Biggest Question, they acknowledged that they had seen a number of people entering the building with the DVDs. They then asked the team to go inside the church to be questioned about the matter. The team then told the police that they had no interest in watching the dance competition, but rather to share the Gospel. The police advised the group to go back out onto the street if they wished to continue their activities. Issa explained that he and the others positioned themselves in a strategic location where they could hand out the film to those entering the event. For a time, all went well — that is, until police noticed some of the youth leaving the building to find the Christians that were distributing the presentation. Issa states that he remained in the wetland for several hours and spoke to the policeman guarding him about repentance and faith in the Lord Jesus Christ. The others with the team had reportedly left for fear that they, too, would be arrested. Issa’s wife and children came looking for him, but were sent away. After some time, the chief came out to see the pastor. However, Issa states that he was forced to endure even more suffering. Near 1 a.m., after the dance competition had ended, Ugandan police informed Issa he was free to go, but warned him to never return again. Because the church was 5 miles from his home, and Issa had no method of transportation, he was forced to walk the entire way after being unchained from the tree. Issa states that his body was swollen from the multitude of mosquito bites, and that he has been feeling weak from the incident. A representative with The Biggest Question told Christian News Network that they first became aware of the situation via Facebook, and immediately posted an emergency prayer request about the matter. Issa credits the prayers of the saints for his release.